November 12, 2009: Our garbage disposal died sometime in October and then a few weeks later one of the springs on our dishwasher door broke too. 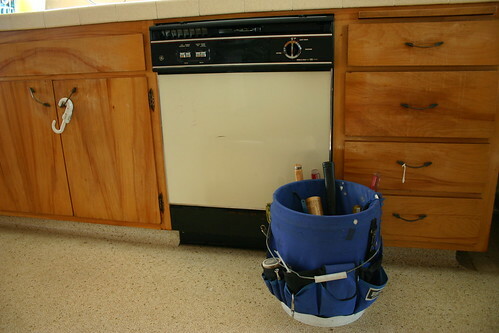 We had been nagging our landlady to come fix both of them for awhile and finally she called on this morning and asked if she could come by with her handyman to do the repairs. She is horrible about not giving us adequate notice before coming to do repairs (24 hours is required by law) and as much as I wanted to tell her to buzz off, I wanted our kitchen appliances fixed more, so I gave her the OK. When she arrived, she didn’t just have her handyman with her, but she also brought her parents! And then they all walked in my house and her parents sat down on the couch next to me where I was working on my laptop — paid work, for money — and stared at me while I attempted to write documentation for a complex web application. Needless to say, I didn’t get a lot done. The best part? With the exception of an hour when they left to go get a part and pick up some lunch (which is when I took this photo) they were there for 4 frakkin’ hours. It’s nice to be a renter sometimes because someone else has to do all the repairs, but the rest of the time you’re dealing with stuff like this. Sheesh. 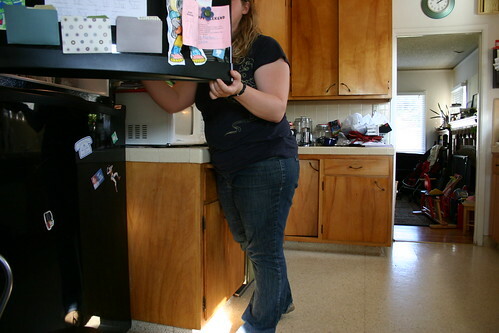 November 13, 2009: This is me, making lunch for August. 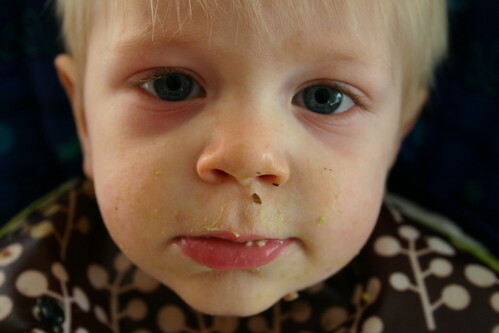 November 14, 2009: This is August eating curry for lunch. November 15, 2009: I took this photo with the webcam on my laptop when I was working at a cafe a few blocks from our house. You can see how long my hair is in this photo which will be shocking when you see how much I cut off a week or so later. 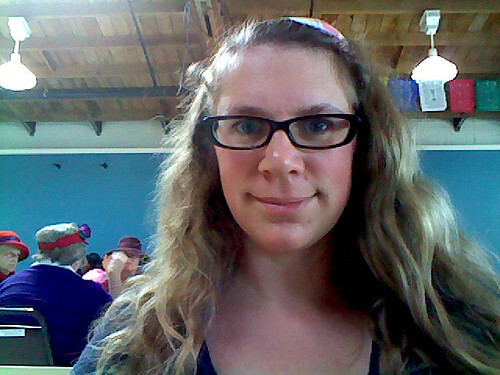 I like how you can see the ladies having a meeting of the red hat society over my shoulder there. 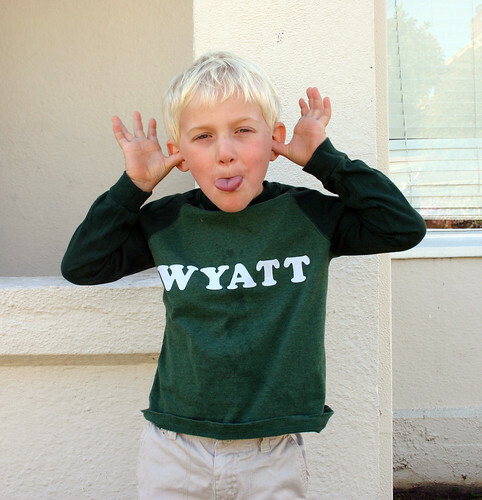 November 16, 2009: I spruced up Wyatt’s t-shirt with some iron-on letters. November 17, 2009: Augie and I took a little walk to a “park” near our house while Wyatt was at school. This park is actually a giant sandbox in a greenbelt under the BART tracks. A few years back, people started bringing plastic toys that were past their prime there and now the space is densely crowded with them. 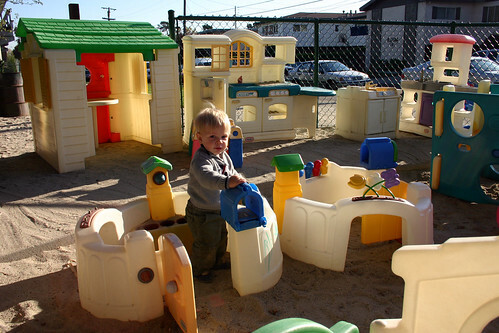 It’s fun for the kids, but you do have to keep a close eye on them and check out everything they play with because some people use it as a dumping ground for broken toys. 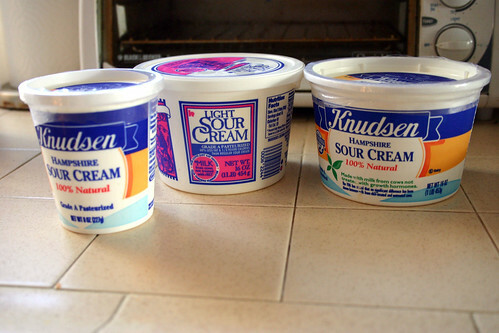 November 18, 2009: Every time I make a recipe that calls for sour cream, I end up buying a new carton because I can’t remember if we have any in the fridge or not or if it’s still good. I found three unopened cartons when I was digging for something else on this particular day.